The way salespeople qualify prospects has changed. According to sales experts, rather than chase prospects away with an endless string of qualifying questions, you need to learn about them, while they learn about you and your company. 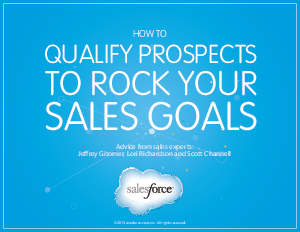 Download this ebook, loaded with practical advice from noted sales leaders, so you can qualify the right prospects and rock your sales goals.